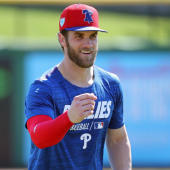 Farmer is getting a start at first base Monday in place of Joey Votto, batting eighth against the Dodgers' Clayton Kershaw, Mark Sheldon of MLB.com reports. The Reds are stacking the lineup with right-handers against Kershaw, with Scott Schebler being the only lefty in the lineup. Farmer is one of five former Dodgers in the lineup along with Yasiel Puig, Schebler, Jose Peraza and Matt Kemp.